because really, who wants to hear about that? shape to go all Master Chef in the kitchen. in all crummy situations life throws us. catching on the bottom of the pot. cook until all the vegetables are done. 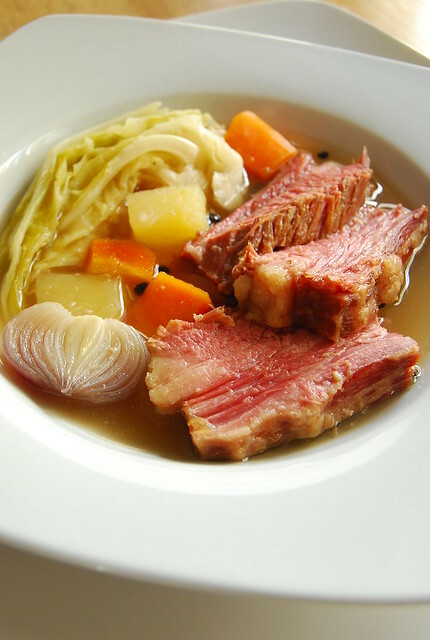 of the corned beef and cooking liquid were already intensely aromatic. serving bowls and cover with the soup and a portion of vegetables. Enjoy hot. during the final hour of cooking. vanilla beans to be shared with you! Very appetizing! A great cold weather dish. The broth from this recipe seems very light. I definitely will cook this for my family. Thanks. Yum. Thank goodness corned beef is readily available here for me. Fall is here and this would make a perfect comfort meal at home. Trying it out with Sinigang this year. What a delish, comforting soup meal and great idea. I haven't done this in a while, and now that it's gotten colder here, must try your recipe soon. Thanks for sharing & thanks for the blog-visit, Joey! It was nice to get together again 🙂 Take it easy! Beautiful, rustic-looking soup! I'm sure it's delicious, too! Anyway, great soup / bad technical stuff! That is a truly beautiful plate of nourishment. Thanks Jeremy! It was delicious!! Hi Rosa! Perfect for cold weather…not that we really have any of that over here! Hi Midge! Hardly…between computer troubles and work, I am still trying to get my head above the backlog! I hope this coming weekend will be more restful! Hi Simone! It was indeed quite a week…now I've fallen sick so it's just gotten more hectic…looking forward to more r&r this weekend, fingers crossed! Hi Mieke! Corned beef sinigang is awesome! Over here most of the corned beef, as you know, is in ‘delata’ form…but this new purveyor is really making a fantastic old school corned beef…I am loving it! Hi BettyAnn! It really makes a comforting dish! Always a pleasure to see you!! Come visit again soon! Hi Shalum! You said it!! Joey – you must, MUST, at least once in your life, have a full-on Turkish breakfast, and yes – in Istanbul. It will turn your life around. It is a stupendous, marvellous thing. Kenny Roger's used to serve a side dish like this. The taste reminded me of nilaga. Now I know how I can try it. I agree, comfort foods like corn beef and cabbage can make the worries of the world seem to go away, at least as long as dinner lasts. Hope next week is better for you. Hi Fork and Whisk! Thanks! Made this soup last night, it was fantastic! What a great idea! I made some traditional Irish soda bread to accompany it for the whole Irish experience! Thanks for the recipe! !